The Tennessee gateway to Great Smoky Mountains National Park and Dolly Parton's unabashedly kitschy Dollywood theme park in Pigeon Forge, and a picturesque city in its own right, with an attractive setting on the Tennessee River, Knoxville (population 180,000) is also a vibrant university city (home to the main campus of the University of Tennessee) with a strong arts scene and an increasingly robust farm-to-table restaurant and cafe selection. Downtown and the adjacent, historic Old City neighborhoods abound with hip places to eat and drink, and here in Tennessee's third-largest city (after Nashville and Memphis), gay and lesbian travelers will discover a decent-size LGBT community and plenty of gay-popular hangouts, from actual gay bars to mixed bars, eateries, and cafes. Knoxville isn't nearly as liberal or LGBT-embracing as the North Carolina gateway to the Smoky's, Asheville, but it does possess some of that city's vibe. Note that the city hosts a very popular Knoxville Gay Pride festival in June. For a city far smaller than Memphis, it's a bit surprising that Knoxville has nearly the same number of gay bars. Like most places, the number of specifically LGBT nightspots has dropped a bit in recent years, but a few notable spots still draw sizable crowds. One of the longest-running and largest gay clubs, The Edge (7211 Kingston Pike, 865-602-2094) is well outside the city center - about 7 miles west of town off I-40 along a busy road lined with strip malls, but it's very much the top gay venue in town for dancing, drag shows, and socializing, and it hosts a number of theme nights, including Tuesday Trivia and Karaoke, Wednesday Game Night (beer pong, flip cup, etc. ), and such. Fridays and Saturdays are all about dancing and drag performances, and occasionally musicians perform live, and the on-site restaurant serves pizzas, corn dogs, chicken wings, nachos, and similar pub fare. More centrally located, Club XYZ (1215 N. Central St., 865-637-4999) is a rather compact bar in a neighborhood with a few good cafes and restaurants, and it's just a few minutes' drive north of the downtown core. The bar tends to pull in a mostly male crowd, including plenty of students from the University of Tennessee, and it's much known for karaoke (there's a huge song catalog), drag performances, hosting the annual "Night of 1000 Dollys" Dolly Parton impersonation show, and great drink specials. Just north of downtown and fairly close to Club XYZ gay bar, Sassy Ann's! (820 N. 4th Ave., 865-525-5839) occupies a rather imposing Victorian mansion - the proprietors like to describe the atmosphere here as "like a big party in Great Grandma's House (if Granny had a taste for liquor and hot dance moves)." It's a very fun place, and the crowd is eclectic as can be for Knoxville - all ages, men and women, quite a few gay patrons. The upper floor (second floor) contains a big dance floor, and there are sometimes live bands, comedians, and other performances here. Above that is a third-floor mezzanine where you can view the crowds below on the dance floor. Downstairs, when you enter, you'll find a darkly light, laid-back vibe with ample seating areas, and a large patio - here, too, you'll find the kitchen, where you can order tasty pub fare, such as burgers, sandwiches, fries and such. If exclusively gay bars aren't your thing, but you're still looking for a great, all-welcoming place to cut loose, Sassy Ann's! is a great bet. Across the street from Club XYZ, Central Flats and Taps (1204 N. Central St., 865-247-0392) is a large, comfy storefront bar and restaurant with a diverse crowd and one of the best craft beer selections in town - there's always a huge list on tap. You can grab a seat at the small bar, but there are also booths and tables set throughout the two main dining rooms. The food here is quite good: barbecue chicken wings, pizzas, crab-artichoke dip, and there's a good cocktail selection, too. If you love great beer, however, this is the biggest reason to stop in. 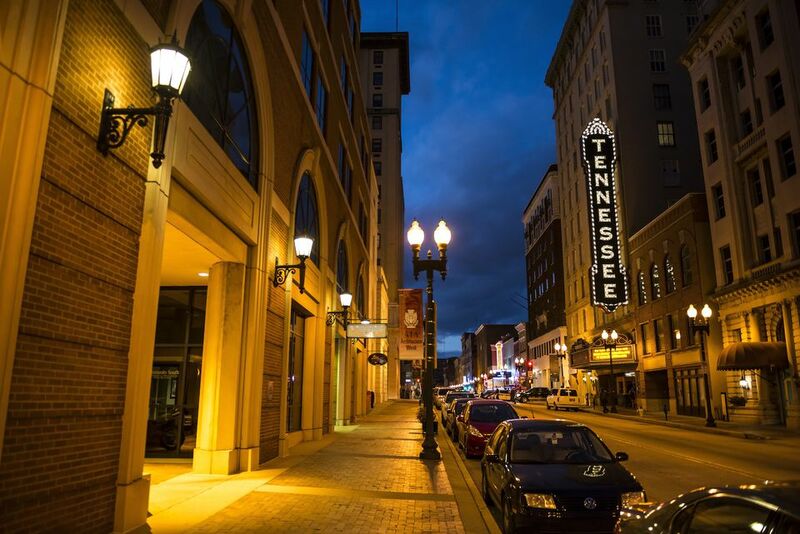 In downtown Knoxville as well as the adjacent Old City district, which lies just northeast between Summit Hill Drive and the train tracks, a robust and decidedly trendy dining scene has evolved over the years. Many of the most popular eateries have late-night menus and make for appealing nightlife options, especially on weekends - they're very much Knoxville's see-and-be-seen hangouts. Many of the better restaurants flank the touristy but still quite fun Market Square, an open-air pedestrian plaza spanning a couple of blocks and set right in the center of the city - the square hosts an extremely popular Market Square Farmers' Market on Saturdays as well as many festivals and seasonal events. Good dining options on Market Square include Stock & Barrel (35 Market Square, 865-766-2075), which specializes in small-batch bourbons and other fine whiskies, along with craft beers and pretty sensational burgers (they're prodigious - try the Farmhouse, with barrel-aged cheddar, Benton's bacon, tomatoes, onion, garlic aioli, and a fried egg); and Tupelo Honey Cafe (1 Market Square, 865-522-0004), a local branch of the Asheville-based modern Southern restaurant that now has several locations throughout the South. It's a favorite spot for brunch. The restaurant and wine bar Uncorked (20 Market Square, 865-521-0600) is also very good, with a nice-size list of vinos and consistently tasty food. A couple of blocks east of Market Square, Gay Street is a prime north-south thoroughfare through downtown, and it also boasts some quite trendy restaurants and nightspots. At the north end of downtown, close to Old City, there's Knox Mason (131 S. Gay St., 865-544-2004), a snazzy neighborhood bistro and bar devoted to locally sourced ingredients and serving superb contemporary Southern fare from a seasonally changing menu - it's hands-down one of the best foodie destinations in eastern Tennessee (you'll probably want to call for reservations on weekends), and the artful cocktails are first-rate, too (sip a Humdinger, with rum, Hum liqueur, white absinthe, orange, Creole bitters, and tonic, for example). Typical goodness from the food menu includes country ham croquettes with Muddy Pond Sorghum mustard, and Shelton Farm cornmeal-crusted Mississippi catfish with Falls Mill grits, house-cured tasso ham, and Red Truck Farm Tennessee chow chow remoulade. Farther south on Gay Street and set inside a glamorous old former jewelry store, Sapphire (428 S. Gay St., 865-637-8181) is another Knoxville hot spot, specializing in fine wines by the glass, cocktails, and small-plates eating - pulled pork nachos, shrimp ceviche, cheese-and-charcuterie plates, and so on. In Knoxville's Old City neighborhood, restaurants and bars line the blocks of Central Street and intersecting Jackson Avenue. Open daily from 7 am until 1 pm (8 am to 2 pm on weekends), OliBea (119 S. Central St., 865-200-5450) serves extraordinarily tasty brunches with a locavore approach. This sunny and casual cafe (beware that it can get crowded, especially on Saturdays) changes its menu regularly but serves fresh juices and great coffee and such notable fare as the Tennessee Benedict, comprising a biscuit, local ham, poached eggs, mashed potatoes, and Hollandaise, and a few Mexican favorites, too, including the carnitas tostada with confit Cheshire pork shoulder, frijoles, queso fresco, eggs, and salsa roja. If you were up late the night before dancing or partaking of Knoxville's fine cocktail scene, OliBea is a perfect place to fuel up in the morning and regain your strength. Given Knoxville's sizable student population, strong arts scene, and growing appreciation for artisan eats and drinks, it's no surprise that the city has some first-rate indie coffeehouses. In Old City, there are a couple of nice spots, including Remedy Coffee (125 W. Jackson Ave., 865-335-0967). It's a great all-day option, open until 7 pm most nights and (and midnight on Fridays). With tall exposed-brick walls, comfy lounge chairs, a cozy upper loft area, great workspaces (tables, outlets, fast Wi-Fi), Remedy serves high-quality java, using traditional brewing, Chemex, and French press options, and serving Intelligentsia Direct Trade coffee. Also in the neighborhood is comfy Old City Java (109 S. Central St., 865-523-9817), a handsome storefront space that carries Direct Trade Counter Culture and Stumptown beans, is open until 7 pm nightly, plus Mast chocolates, and excellent baked goods. There's live music some night and cool artwork on the walls, then the staff couldn't be more friendly and welcoming. On warm days, grab a seat at one of the outdoor tables in the adjacent alley. On the west side of town, another excellent source of top-notch coffee is Third Creek Coffee (2920 Sutherland Ave., 865-333-4915), a bright and cheerful little place with a compact but comfy seating area and a contemporary feel. It's close to the Knoxville City Greenways trail and park system, making it a popular spot with bikers, runners, and other enjoying the greenery west of downtown.